I was born in Weymouth, MA in 1991. Moving to Los Angeles shortly thereafter, I have grown up in one of the busiest and most diverse cities in the world. Being raised in the arts, I always pursued a number of creative ventures, those being my constant interests. I have been acting, live action and voice, as well as writing fiction and for screen, since the age of 13, and it has been an incredible adventure. I love people, and I love to help. I want to see the world become a better and happier place, and I want to have a big hand in that. One of my first passions was acting. I was eager, throughout my childhood, to participate in every school play, function, and musical that I possibly could, and took every acting class available. Eventually I decided to pursue it professionally with encouragement from my parents (my father, Bob Caso, also being an actor). Soon I was auditioning, shortly thereafter booking a lead role in the independent film “Humble Pie”. This was my first taste of the professional acting field, and I learned many lessons that have shaped who I am as an actor and a person to this day. Not too long after Humble Pie I auditioned for and booked the role of “Bladezz” on the hit series “The Guild” with co-stars Felicia Day, Sandeep Parikh, Jeffery Lewis, Robin Thorsen, and Amy Okuda. This is the role I’ve become best known for, and has provided me with innumerable opportunities. The extremely supportive, and incredibly large, base of fans that has developed around The Guild is made up of incredible people, and we would not be here without them. They’ve made us all feel that the show is worth something, and that our participation is valuable, something we are extremely appreciative for. From a young age I have always been interested in the mystical arts. An avid practitioner of simple and self-working tricks since the age of 6, I later performed walk-around magic at the esteemed Magic Castle in Hollywood, California, as well as performances for parties, groups large and small, and demonstrations of skill in the popular online show “The Guild” – in which I also co-starred. 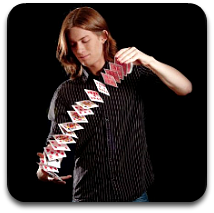 At the age of 12 I branched off into the field of Card Manipulation (known alternatively as “Cardistry” and “Flourishing”), which I have practiced and performed for the last 9 years. This visual art incorporates a deck of playing cards that is cut, spread, twisted and manipulated into a variety of impressive and aesthetic stunts. One such example is the image just above, known as the “Card Spring”. From the moment of having dictated my very first story at the age of 3 to the present day, I’ve kept up a fiery passion for storytelling. While time to write, and the dedication to see a given work through, have unfortunately taken a back seat to my other ventures in recent years, it is something I am no less interested and excited to further pursue. In fact, I am currently writing my first novels,“Sleepsight” and “Silent Lights” due to be published in 2017! Stay in touch with me on Twitter where I’ll post updates as they come! Questions? Comments? Need to get in touch with me? No problem! You can reach me via e-mail at the form below. Allow up to 48 hours for a reply, things can get busy! If it’s press-related, include the nature of the request in the message (video interview, photoshoot, podcast, etc) and the company or media outlet that the gig is for (or, if it is for an individual/independent project, mention that). Also include any related information such as questions to be asked, topics to be discussed, etc.